Phuket's most exclusive beach front villa, located directly on the island's most beautiful white sand beach. Including 10-ensuite bedrooms, two jacuzzi's, spa, award-winning infinity pool, sea-front dining, plus every luxury including full-time housekeeping staff and your own personal concierge. Baan Amandeha is a brand new private luxury beach villa, located in the centre of Ao Yon Bay, Phuket's most beautiful white sand beach. Ao Yon beach is picturesque and sheltered, and is therefore one of the select few beaches on Phuket that offer you 365 days a year swimming. Phuket's west coast beaches are all closed for most of the period from May thru Nov, plus closed on any days with strong tides. This is especially important for families with children. It is located on Phuket's famous Cape Panwa peninsular, which is surrounded by beautiful islands and is the gateway to the islands of southern Phuket such as Phi Phi Island and Koh Racha. Cape Panwa, on Phuket's southern coast is where you'll find the luxury end of tourism and away from Phuket's lower-end mass-tourist offerings found on the west coast, making it perfect for both families and those seeking an exclusive, luxurious and relaxing beach holiday. Outside there are carefully landscaped gardens, with ornamental pots, tropical plants, palm trees, and a 200 years old tamarind tree. There is a fully-equipped bar and BBQ, and infinity edge 12m swimming pool, with sunken seating, sun loungers plus beach-club cabana style seating perfect to give you shade, or enjoy a massage by the beach. You'll enjoy wonderful sea views from every corner of the garden, and can access the beach and sea directly from the garden. The villa also enjoys a fully equipped spa, with a twin bed massage room, plus steam room. Our massage therapists will come to the villa and you can enjoy a whole range of relaxing treatments. Baan Amandeha Beach Retreat is a very special place, a one in a million property. It is arguably Phuket's finest property when you consider it's direct beach access and seafront location, plus it's modern contemporary design. Consider the attentive service levels you will receive, with full-time housekeeping and your own personal concierge, it must become your favourite choice. Baan Amandeha is perfect for families due to the direct beach access and safe seas for children, but would also make the perfect party house for groups of friends or a private wedding too. In business for nearly 20-years, we personally own and also directly manage each of our villas. Here's what makes us different, and why it's good news for you. Our reputation is second to none and it is important for you to know why we are so unique in luxury villa rentals. To ensure a wonderful, safe and trouble-free villa holiday see the following points that separate us from the crowd. Be aware of all rental companies that cannot guarantee you these same high standards. 10 meters to Ao Yon Beach with views of distant islands, white-sand beach and clear blue sea, that allows year-round swimming. 5 minutes to Cape Panwa and it range of local boutiques, night market, coffee shops, bars, restaurants and sea promenade. 5 minutes to the luxury resort of Sri Panwa, Phuket's finest resort and home to three of Phuket's finest restaurants (Japanese, Thai and International), it also has Baba's Nest voted as the World's 2nd best beach bar by CNN Traveller. Cocktails here as the sun sets are a magical experience. 15 minutes to Phuket's famous Night Market with 100's of bustling stalls selling food, locally made products, gifts, handicrafts, beauty and fashion products. 15 minutes to Phuket Islands main shopping centre, with 100's of international brands, 30 - 40 restaurants, gift shops, cinema, delicatessen, 100+ fashion shops, plus international supermarket. 20 minutes to Asia's largest seated Buddha, plus Phuket's main Buddhist temple complex. 15 - 40 minute boat trip away from 8 of the most stunning islands off of Phuket's southern coast. Kids activities (if you wish to leave Ao Yon Beach), including, on-sea inflatable water park, water park with slides, zoo/safari park, go karting, ATV rides, elephant rides and trekking, cable water skiing, jungle adventure parks, are all within 5 – 30 mins away. Private yacht charter, organised boat trips/cruises, water sports, paddle boarding, jet ski, water skiing and sailing can all be arranged locally. All bathrooms are designed in a clean and contemporary style, with neutral stone, white ceramic and glass materials. They are all spacious, light and a welcome start to your day. Twin large American-style stainless steel fridge/freezer. Professional hob, with 5 gas rings, 2 electric rings, and integral lava-stone grill. Ground floor, which also contains bedrooms, and all living and entertainment areas. "Who says, paradise is not on earth"
From the onset, our vacation started with a plethora of suggestions, ideas and opinions from people ranging from the age of 5-45. Everyone had a different idea for a perfect holiday in mind. By pure accident, we checked out 'Ultimateluxuryvillarentals.com' and found an answer to our cumulative questions. Hessel and Julia were helpful, understanding and flexible to accommodate our needs from the first interaction we had with them. It felt like they were a part of the group who wanted to make our vacation a memorable one. They patiently handled all our queries, made relevant suggestions, were clear about what our villa had to offer (no hidden costs) and ensured everything was well planned before we left. On arrival, we were taken to our home away from home, Villa Baan Amandeha. We were 8 Adults, 4 children and 1 infant. The transfer was smooth and the staff was courteous and helpful. Our feeling when we entered the villa can be best described as 'surreal'. The villa, its location, the pool, the rooms and their layout, the spacious living area, massage rooms and kitchen, all seemed perfect. Villa Baan Amandeha had everything to offer. For 10 days we were looked after by the villa manager Jay and his team. He was extremely helpful and did his best to make our stay comfortable, to say the least. We had canoes that we could use, private massage rooms, good restaurants in the neighbourhood, 12 seater jacuzzi in the pool, all of which we used throughout our stay. The rooms were spacious, facilities were plenty and the vibe was enviable. Jay even arranged for us to rent a private boat and visit the nearby islands as we pleased. The hospitality made our 10 day trip come to an end in a flash and out of sheer shock, we extended our holiday by another 2 nights. All good things come to an end, they say, but for once we hoped this wouldn't. Unfortunately, it did. It was our most memorable holiday where we spent 13 days at the same destination, inside our home without ever wanting to step out. Phuket forever will be synonymous with Villa Baan Amandeha. The only one problem that we have to face is ever finding a location anywhere which will live up to this. Until then and forever, his holiday will be etched in our memory. Thank you so much for your wonderful review of our villa. We are so pleased you all had a fabulous time and thoroughly enjoyed it. Sadly holidays must end but we do hope you visit us again here or in another of our villas. I can honestly say that our time in Phuket was even more special than we ever could have hoped or planned for. We spent a good amount of time trying to find the right place that could fit our large group of 24 people comfortably. It wasn’t until we happened upon Villa Baan Amendeha and the Beach House next door that we ever really believed it could be a possibility. Working with Julia and Steve to get the villa booked and our trip coordinated prior to arrival eased a lot of the worry we previously had during our planning process. In pictures the villa is breath taking; almost to the point of not being believable. Seeing the villa in person is almost equally unbelievable. The villa is situated in the most perfect location on the island. Ao Yon Bay is calm and beautiful. The sun rises over the hills across the bay that the villa faces. We made a habit of waking up every morning to watch the sunrise in or around the pool. It was the perfect start to the day. Speaking of the pool area, it was perfect for a group our size. There is more than enough lounge area, and the water is always clean, sparkling, and the perfect temperature. The beach just off the property is perfect for swimming as well. Because the bay is so calm it made for perfect swimming conditions pretty much every day we were there. As far as both villas go the accommodations are top notch. The houses are planned so well, and the architecture is stunning. Everything you could need for your trip is provided. There was more than enough space for our large group. The pool table and ping pong table allowed for hours of competitive fun for our group. The communal area and dining table worked great for us. The proximity to Sri Panwa and other surrounding attractions and restaurants worked great as well. As I said before, it was more than we could have asked for. Thank you for your absolutely fantastic response to your stay at our villa Baan Amandeha in Phuket. It was lovely having you and your guests stay with us and we are over the moon that you enjoyed it so much that you want to return. We look forward to hosting your holiday all over again ! Amazing property - fully lives up to its description and if anything, exceeded expectations. February 2017: We booked a family holiday for 20 of us, traveling from all over the world for a relaxing week in Phuket. Baan Amendaha was perfect for us. We were warmly welcomed on the first day by Jay, An and the other staff members. Roy the bus driver was at our beck and call all week for transport to and from the airport, supermarket, night market and Phuket town. We were able to rent mopeds for everyone five minutes walk on the road which gave us access to the entire peninsula. We used the chef and staff services for some incredible thai meals and some of us took a cooking class so we could prepare our own. We made great use of the 2-man kayak provided to tour local islands and beaches. We also fully stocked the outside bar and fired up the barbecue every day. Loved the pool table and ping pong and other family friendly amenities. The large family room was perfect for late evening games, dinners and drinks. It never felt crowded. The bedrooms were all fantastic - the house really doesn't have a bad room. It was such a fantastic trip that none of us wanted to leave on the last day. Would highly recommend this place to anyone looking to accommodate a larger group. In summary, great house, perfect location and wonderful holiday. Thank you for the wonderful review, we are so happy that you enjoyed the villa and all it has to offer. We really hope to see you again in the future at one of our villas. ! Staying at Villa Baan Amandeha was an absolute dream. The chef cooked amazing meals for us all week, the staff were fun and kept our house in order, and Jay made every wish come true. If I needed transportation it was there in 5 minutes. If we wanted massages- all it took was a phone call. Jay was always there to help with anything, and recommend great spots to visit as well. The Villa itself far exceeded my expectations (which is VERY hard to do). All the rooms are large and well equipped with everything you could need. The beds are comfortable, and the open concept living area is the perfect spot to hang out with friends as you watch the sun set on the beach outside your door. We spent a ton of time in the pool, playing ping-pong, and having drinks at the outdoor bar. The location of the villa is ideal. It is close to everything you want, but not in the middle of the chaos that is Patong. I would recommend this villa to anyone looking for a luxury stay in Phuket. It had everything I could have asked for in a villa. They had to kick me out at the end of the week! Beach Advice: Please see advice given under "local Activities"
1 - 5 minutes to ATM, grocery store, convenience store, taxi, pharmacy, bakery, local restaurants, beach walks, side-walk cafés, gift shops, tour shops, motorbike hire, massage, hairstyle, health & beauty treatments. 1 minute to Phuket's most beautiful public beaches that allow year-round swimming. 15 minutes to Phuket Islands main shopping centre, with 100's of international brands, with 30 - 40 restaurants, gift shops, cinema, 100's of fashion shops, delicatessen and supermarket. 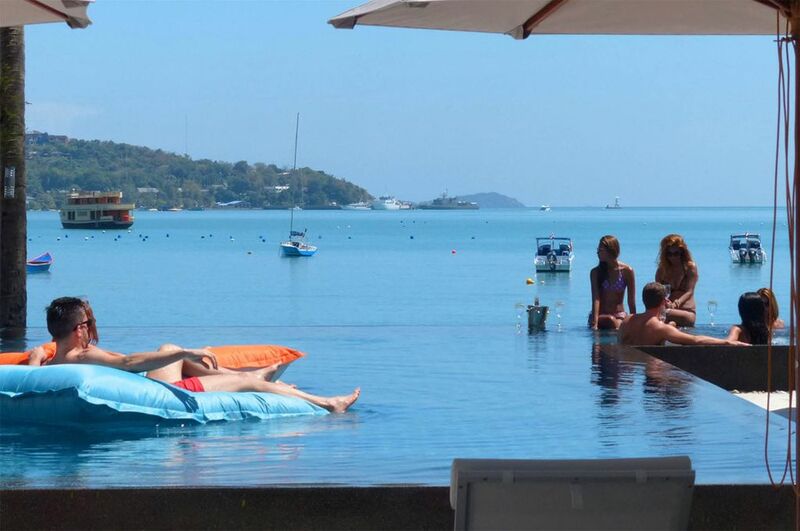 Our rates include:- Complimentary use of all of the amenities within Baan Amandeha, luxury beach retreat. A mid-week bedding change. Luxury toiletries in the bathrooms. Luxury indoor and outdoor towels. Free high-speed WI-Fi internet access. Complimentary transfers to and from the airport. Complimentary use of the spa and steam room. FREE full time, 7-days-a-week complimentary housekeeping service. FREE 13-seat mini-bus and driver worth, £165 per day. FREE use of all beach equipment such as canoes and snorkelling equipment.